Alex Heiche, CEO of music industry finance firm Sound Royalties, will participate in a panel discussion on "The Rise of the Digital Market" at the upcoming Los Angeles Digital Content Marketplace (L.A.DCM). The event will take place this Friday, June 22 from 5-8 p.m. at YouTube Spaces Los Angeles. I'm looking forward to participating in L.A.DCM and having some dynamic conversations about the future of music and Sound Royalties' role in the shifting music finance industry. Sound Royalties announced today that its Founder and CEO, Alex Heiche, will speak at the inaugural Los Angeles Digital Content Marketplace (L.A.DCM) event this Friday June 22, 2018. A music industry expert and advocate, Heiche will participate in a panel entitled "The Rise of the Digital Market" at L.A.DCM, which runs from 5-8 p.m. and will be held at YouTube Spaces Los Angeles. The panel will discuss timely topics such as the rise of the digital market and on-demand content, and what these industry changes mean for record labels, artists and other music professionals. With the decline in physical record sales and the rise of streaming media, this hot-topic panel will discuss new ways to engage music streaming consumers globally. Moderated by actor Darris Love, Heiche will be accompanied on the panel by Urban/Pop music industry insider Tuff Morgan. "I'm looking forward to participating in L.A.DCM and having some dynamic conversations about the future of music and Sound Royalties' role in the shifting music finance industry," said Heiche. "I am a strong advocate for songwriters and creatives. I thoughtfully built this business with the belief that creatives at all levels should have the ability to share their music with the world and that they shouldn't have to give up their rights when accessing funding. The Sound Royalties team is always ready to share our insights with up-and-coming music professionals to help them succeed in this complex and ever-evolving business." Jason Robinson, Founder of L.A.DCM added: "We look forward to bringing together the seasoned, industry veterans and the impressive, upcoming talents that encompass this new vibrant, digital ecosystem. We hope to encourage new relationships and facilitate substantive discussions through this exclusive event." Hosted by Dream Scenario Productions, L.A.DCM is an independently organized event that will bring together industry leaders to share their knowledge with those interested in learning how to build their network, talent and understanding of the music and entertainment business. The event will include multiple industry panels, live performances, tasting mixers and more. This event is open to all industry professionals, and music lovers are encouraged to log on, subscribe and sign-up for private invitations to live stream events. For more information, please go to LADCM.org. The event will be live-streamed on both YouTube and Gone Viral Live. 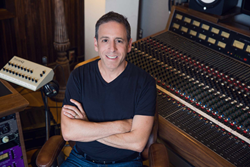 Founded by CEO Alex Heiche, Sound Royalties, LLC is a privately-owned specialty finance firm that helps music industry professionals fund personal and professional projects while allowing them to retain the rights to their music and royalties. The company's core business is offering royalty advances of anywhere from $5,000 to $10 million, while preserving all rights to the artist's music. It does this by advancing artist, producer and songwriter royalties paid through music labels, distributers, publishers and PROs, and performance royalties paid through Sound Exchange. To date, Sound Royalties, LLC has worked with a wide range of leading music industry professionals, including Grammy Award winners, platinum recording artists and notable music industry executives in every genre. Learn more at https://www.soundroyalties.com.